This beloved device has been improved in nearly every possible way. But, can it win back the hearts and minds of iPhone and Android converts? 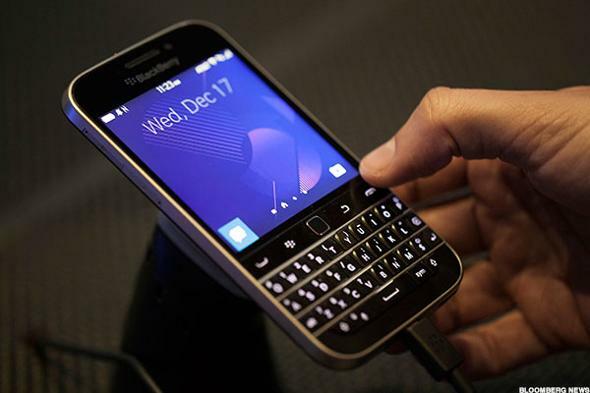 NEW YORK (TheStreet) -- The new BlackBerry (BBRY Classic is aptly named. It is the ultimate, secure email-centric device/smartphone. The latest in the company's long heritage of secure email devices. It's a terrific handset in many ways. Just don't expect it to be something that it's not. The Classic is an email device that's also a smartphone. Apple (AAPL - Get Report) iPhones and Google (GOOG - Get Report) Androids are smartphones that handle email. It's a subtle but important distinction. BlackBerry isn't trying to pull the wool over anyone's eyes. The Classic was designed to replace its still popular (in some circles) but now very long-in-the-tooth Bold 9900 and even older smartphones that "CrackBerry" loyalists refuse to retire. As the story goes, when John Chen took over as CEO a year ago he wondered why requests by rabid fans for a new "classic" device were being ignored. He promptly ordered the development of this new phone. Long-time BlackBerry fans won't be disappointed. The Classic rewards users with a square, 3.5-inch, 720 by 720 pixels (294 pixels-per-inch) HD touchscreen on top and the company's famous 4-row, 40-button, QWERTY keyboard below. Separating the two halves is a narrow row of navigation buttons and a tiny, touch-sensitive, trackpad pointing device. Inside there's a 1.5 GHz, dual-core Qualcomm (QCOM - Get Report) Snapdragon processor with 2 GB of RAM and 16 GB of storage (expandable to 128 GB with an optional microSD card). There's an 8 megapixel camera on the back and a 2 MP shooter facing forward. There's Wi-fi, Bluetooth, GPS, NFC and a micro USB port. It measures 5.2 by 2.9 by 0.40 inches and weighs-in at a solid 6.24 ounces. AT&T (T - Get Report) retail stores will carry the GSM version of the Classic. Our unlocked GSM test sample ($449) also worked perfectly using a T-Mobile (TMUS - Get Report) SIM card. Verizon (VZ - Get Report) will have a model designed for its network in the new year. Classic runs on BlackBerry's latest operating system, version 10.3.1. The OS is based on the QNX OS core which is somewhat compatible with the Android OS. That means some, but not all Android apps can run on a modern BlackBerry. Compatible apps come via the BlackBerry World app store or the Amazon.com (AMZN - Get Report) store (links for both are pre-installed). Between both stores there are a good number of available apps for the device but nowhere near the number of software offerings available for an Android or iPhone. But, that's OK. Many of the major, well-known titles are available. As you might expect Classic does email very, very well. A slew of messaging accounts can be added to your BlackBerry phone's "Hub" system so you can see all incoming dispatches in one place. For instance, we have three email accounts, plus Facebook (FB - Get Report) , Twitter (TWTR - Get Report) , LinkedIn (LNKD , plus phone carrier-based text messaging, voice call messages, emergency alerts and also BlackBerry BBM all being displayed in the same application. I can choose to see one account or all accounts at the same time. It saves an enormous amount of time dealing with these accounts and that's what BlackBerry is all about. And then there's the physical keyboard. It represents the latest in a long line of BlackBerry designs meant to promote typing speed, accuracy and ease of use. The keyboard, as always is terrific. Small and slightly cramped for those with larger fingers -- but terrific. If you've gotten used to typing on a flat piece of glass on most other phones then pressing real keys will take some getting used to again. Think in terms of a few hours not a lifetime. The trusty "ALT" key to access numbers and punctuation and the "SYM" key for symbols are still there.. And, the keyboard still supports those simple, yer powerful one-key shortcuts BlackBerry is famous for. For instance, pressing and holding the "Q" key quiets the phone's audio. You get the idea. There are dozens more. All shortcuts are user programmable. The Classic is designed for power communicators. That means this phone is not for everyone. Some parts of the Classic's interface are awkwardly "kludgey" compared to the competition. If you're used to navigating on iPhones or Androids the BlackBerry will definitely take some time to get used to. But, using this device becomes second nature after a short break-in period. The breaking-in is not for the hardware but more for the user. BlackBerry admitted that fact during its recent press conference introduction of the Classic. As with past models using a BlackBerry is a learned skill and once it's ingrained in your brain you won't have to look at the keys as you type. Your fingers will know exactly where to go. The 8 MP rear camera took some good photos but we found the camera took a long time to focus and take the shot. Voice call quality was superb. As with previous BlackBerries, the Classic's Wi-fi and 4G/LTE connections were fast and bullet-proof. BlackBerry Assist, a voice-activated helper just like Apple, Google and Microsoft (MSFT - Get Report) have works well but is not yet as helpful as the competition's. The best feature is this phone's battery life. The built-in, 3,450 mAh rechargeable battery pack provided us with nearly two days of heavy usage. Pure BlackBerry there too. Compared to the BlackBerry Passport, its larger, more expensive sibling, the Classic's screen is smaller and not as easy to see or navigate. Yes, you can make the fonts larger on the Classic but the Passport's 4.5-inch glass slab provides more room for handling everything. Overall, the Passport is also a more modern design in almost every respect. In basic terms, the Classic is more smartphone while the the Passport more "phablet". Passport is also more expensive -- $700 for an unlocked GSM model although it's currently discounted to $550 on Amazon.com. The bottom line? If you're currently using a smartphone made by another manufacturer I'd recommend investigating whether or not you could be happy switching to a BlackBerry Classic. You would be giving up a lot of functionality (and all those apps) but gaining BlackBerry's best feature: secure messaging. But, if you're a die-hard fan and your Bold (or even older BlackBerry) is finally starting to crumble in your hands then seeking out a new Classic is a no-brainer. "We rate BLACKBERRY LTD (BBRY) a SELL. This is driven by a number of negative factors, which we believe should have a greater impact than any strengths, and could make it more difficult for investors to achieve positive results compared to most of the stocks we cover. The area that we feel has been the company's primary weakness has been its declining revenues."